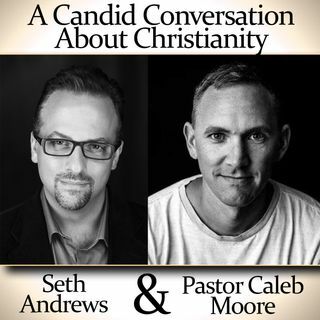 Caleb Moore is a Baptist pastor who expressed interest in talking with Seth Andrews about God, Christianity, atheism, and more. Their conversation - unedited - is releasing both here and on Pastor Caleb's podcast in the hopes of furthering discussion on both platforms and providing an example of how strong disagreement doesn't have to make us enemies. Support our sponsor: Get a free trial at The Great Courses Plus with this ... See More special URL. "We use reason a lot. We use logic." Nope. Not one thing out of his mouth was reason or logic. As a former fundamentalist, I still cannot understand how people believe this. I have listened to your podcast from the beginning, your calming approach to tough conversations have been very meaningful to me and my wife. We grew up seventh-Day Adventist which means we have had a long ways to come. I will never forget a road trip my wife and I took and listening to your first book.